tiberCAD is a software tool for numerical simulation in the field of electronic and optoelectronic devices. It allows to model and design innovative and nanostructured devices, such as III/V LEDs, nanowire FETs, Dye Solar Cells (DSCs). Both Atomistic and Continuous FEM-based models are available. tiberCAD is a multiphysics tool, that is it is able to solve different physical models involved in device simulation. It is also a multiscale tool, since it allows the simultaneous solution of physical models on different length scales, ranging from FEM continuous models to atomistic descriptions. With tiberCAD, quantum and classical descriptions can be used in different regions of a device/nanostructure within the same simulation; analysis and optimization may be performed at all the relevant length scales, possibly including self-consistent coupling of different models, such as quantum/drift-diffusion and thermal/drift-diffusion. A Valence Force Field (VFF) model for the relaxation of crystalline structures allows to take into account internal strain. VFF may be used in combination with other atomistic methods, such as Empirical Tight Binding (ETB), for the calculation of electronic and optical properties of Nanowires, Quantum Dots and Quantum Wells. Such atomistic simulation models may be coupled to continuous level models for transport and light generation. Atomistic-based Empirical Tight Binding (ETB) calculations of electronic and optical properties, including random alloy approach to treat in a fundamental way alloy fluctuations in LED active regions. Accurate ETB sp3s*d parameterization for several materials, including GaN/AlGaN/InGaN systems. 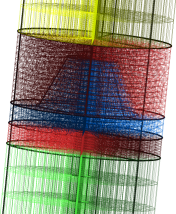 With tiberCAD it is possible to perform reliable simulations by taking into account the most important physical concepts emerging in the last developments of nanoelectronics and nanotechnology, such as quantum mechanical effects, strain and polarization in heterostructure semiconductor devices, self-heating and thermal transport. For more information, applications and documentation on tiberCAD project see also www.tibercad.org.